Learn some interesting information about Argentina while enjoying a range of fun facts and trivia that's perfect for kids! Read about the highest mountain, Nobel Prize recipients, national parks, bordering countries, language, the Argentine sport Pato and much more. The official name of Argentina is the Argentine Republic. The name Argentina comes from the Latin word for sliver 'argentum'. 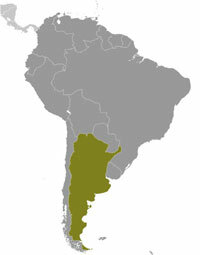 By land area Argentina is the 2nd largest country in South America and the 8th largest country in the world. Spanish is the official language of Argentina but there are many other languages spoken throughout the country. Argentina shares a land border with 5 countries including Chile, Brazil, Uruguay, Bolivia and Paraguay. The capital city of Argentina is Buenos Aires. Argentina has a population of over 42 million people (42,610,981) as of July 2013. Argentina borders the Andes mountain range to the west, the highest point is Mount Aconcagua 6,962 m (22,841 ft) located in the Mendoza province. The Latin dance and music called the Tango began in Buenos Aires. The currency of Argentina is called the Peso. Argentine cartoonist Quirino Cristiani made and released the world's first two animated feature films in 1917 and 1918. The most popular sport in Argentina is football (soccer), the Argentine national team has won the football World Cup twice in 1978 and 1986. The national sport of Argentina is Pato a game played on horseback. It takes aspects from polo and basketball. The word Pato is Spanish for 'duck' as early games used a live duck inside a basket instead of a ball. Basketball, Polo, rugby, golf and women's field hockey are also popular sports in the country. There are over 30 national parks in Argentina. For more information, check out maps of Argentina or take a closer look at the Argentinian flag.